One of the pressing questions at this week’s #kidlitchat on Twitter was about an author’s online presence. Specifically, does what an author writes on his or her blog or website color an prospective agent or editor’s thoughts about working with that author? And for the most part, the answer was no, “unless you’re doing something really stupid.” Which carried over into another discussion about how everything you do online is public, and should be considered as such, since it’s searchable, and can live forever. So when I saw this article today on Jezebel, I thought it tied in nicely, if obliquely, with that conversation. Personas is an art installation that “generates a visualization of a person’s online identity.” Another quote: “In short, Personas shows you how the Internet sees you. ” It doesn’t distinguish between multiple owners of the same name, so the results can be somewhat skewed, but I couldn’t help but think of authors who might be struggling to be sure their online presence is hitting the right marks. Now you can find out if it is! 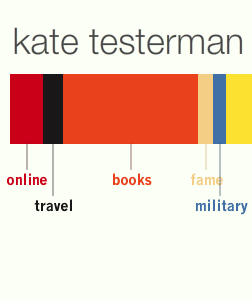 Just for fun, I entered “Kate Testerman,” and got this lovely bar graph. while “Kate Schafer Testerman,” with the least amount of data to pull from, finally acknowledges that sports are not as important to me as books. How brightly colored are you? And do you think this comes close to representing you, or do you look at it just as an art project? Oooh! Fun! I almost never do anything under my real name online, so when I type that in, the results don't represent me AT ALL. But when I type in Twas Brillig? Spot on. What a cool program! haha, I was just blogging about this online persona thing…but oh my! I'm kind of curious about the fact that a big chunk of my graph is labeled "illegal"??? eep! My name's too generic. Even my maiden name is generic. Debating changing my name to something really off beat just so this will work. Actually, that's just an excuse to change my name to something silly. Education and Management were my two biggest chunks, with books being a *tiny* sliver the same size as fame. Politics was a bigger sliver than books. Sad. Really interesting. I put in my name and it based the chart on three sentences about me–one from your blog. I got twelve different categories shown–and one big one was "illegal"! I also tried putting in the name of a popular fictional character and it took forever. It based the results on 28 different sentences (!) and in the end 27 categories were shown. I guess this shows that fictional people are much more interesting? It won't let me do it. My screen is not large enough or something. I did mine! I'll try to post it on my blog later. There was a big chunk for online and books, some for education, and the rest was rather small. I didn't have any sports, which should tell you something. Weirdly, I did have a small section for medicine..??? Well, that was way too much fun. Um, fashion was bigger than education. No idea what that's about, especially since I have quite a few published articles on teaching ESL. Must be some other, more fashion-conscious Michelle Schusterman out there! This was so cool! Very fun. I will have to blog about it. I had a big section on military. No idea why unless it's because I live in Korea. Weird. Books was my biggest section. Makes sense. Christina! I'm in Korea too! Are you teaching ESL? Wow! What a neat little chart. There are quite a few people with my name, so it's a bit off. The main ones are sports, books, and online. Sports must be all the other Casey McCormicks. Trust me when I say that has nothing to do with me. Ha! How did you copy the graphic over? I did this for my name after seeing it on Jezebel, but it wouldn't let me coy the graphic! Misrule, I use a program called "Snagit," that let's me highlight anything on my computer, and capture it as a graphic. I highly recommend it. I have two online personas, one with my real name (that I use on my writing website, facebook, and things I don't mind work-people seeing) and another with a version of my name (like a pen-name, almost) that people looking up "Rebecca Enzor" or "Rebecca Stypula" wouldn't find. And that's where I do all my silly little things, like rants, and memes, and My Little Pony trading, and talking about whatever goofy thing I want. But when I look up "Rebecca Enzor", I mostly get an old lady who is married to a guy named Ken in the army, who likes to throw parties. So my graph shows "Military" and "Social" (completly not me) big-time.